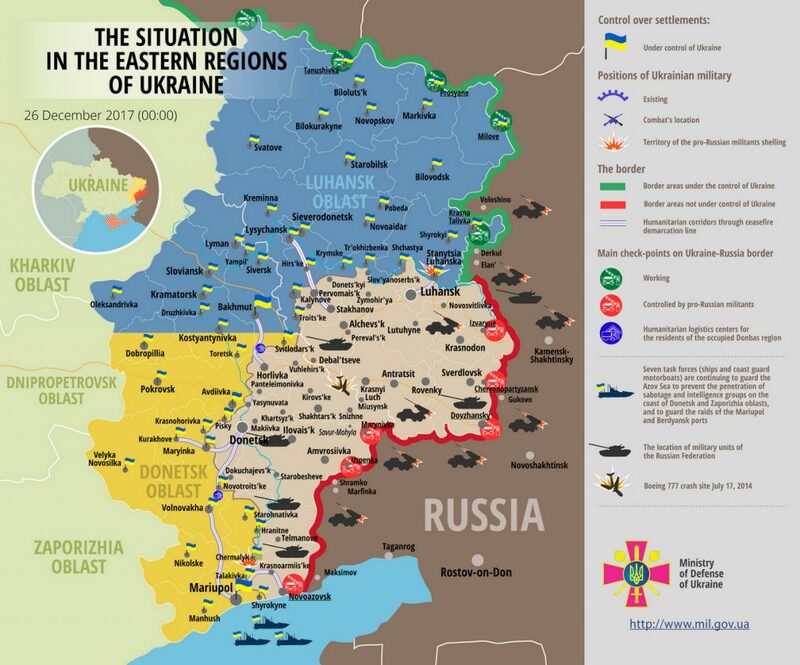 Russia-backed militants delivered two attacks on Ukrainian troops’ positions in eastern Ukraine yesterday. Fortunately, Ukrainian Armed Forces incurred no casualties, reported Colonel Oleksandr Motuzyanyk, Ukrainian Ministry of Defense spokesman on ATO, at a press briefing at Ukraine Crisis Media Center. In Luhansk sector, Russian proxies opened small arms fire against Ukrainian troops’ positions near Stanytsia Luhanska after 21:00. In Donetsk sector, Russia-backed militants shelled Ukrainian positions outside Pavlopil at about 19:00 having fired five 120-mm mortar rounds. “The above attacks were of provocative nature and were not life-threatening, thus Ukrainian troops did not return fire,” Colonel Motuzyanyk said. Report on the military developments as of December 25 is available here. Interactive data on the shelling: chronology shelling chart and the interactive map.